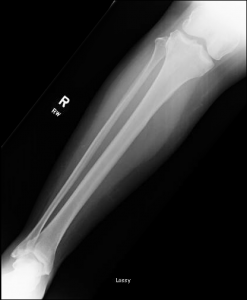 This case outlines the management of a 61-year-old undiagnosed diabetic female who presented to the emergency department with signs and symptoms consistent with an acute Achilles rupture. The patient was referred to the foot and ankle clinic for routine management. Due to inconsistent clinical findings and progressive worsening of status in clinical exam, additional tests were ordered which revealed a 11.4 cm abscess in the posterior compartment of the right leg and an intact Achilles tendon. The patient underwent a staged incision and drainage with removal of all nonviable tissue resulting in a 4 cm x 1.4 cm defect. She underwent negative pressure wound VAC therapy resulting in full closure of the wound. This treatment led to resolution of the infection, limb salvage and preserved limb functionality. 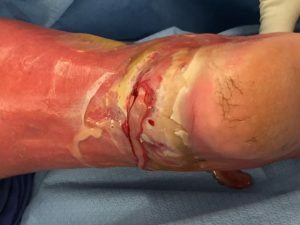 We present a unique case in which an undiagnosed diabetic patient presented to the emergency department with symptomatology and history consistent with an acute Achilles tendon rupture. Despite having no constitutional symptoms, the patient was found to have a large abscess of the posterior compartment of the right lower leg. 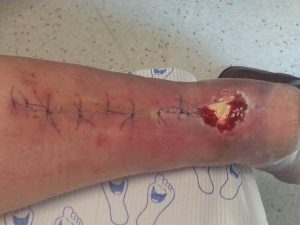 This case report describes the diagnostic tests, surgical intervention and wound care techniques that eventually led to resolution of the infection and preserved limb functionality. 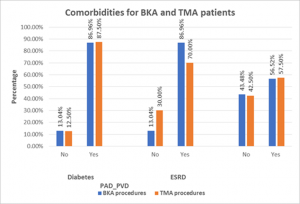 It also draws attention to the fact that uncontrolled diabetes has the propensity to allow for large-scale infections in patients that have no open wounds or obvious sources of infection. Diabetes mellitus (DM) presents a wide variety of systemic complications for affected patients. Of interest to this case is the diabetic individual’s reduced ability to mount an immune response, thereby masking the constitutional signs and symptoms of infection (fever, tachycardia, hypotension and tachypnea) . In the previously undiagnosed patient, this abnormal presentation may delay and/or prevent proper diagnosis and treatment. The primary mechanism of immunosuppression is due to the altered structure and function of the diabetic polymorphonuclear cells, monocytes and macrophages compared to non diabetics [2,3]. The diabetic patient is also at an increased risk for infection as certain microorganisms become more virulent in a high glucose environment . Microorganisms also demonstrate an increased adherence to diabetic cells as compared to non diabetic cells [5,6]. For this reason, physicians caring for diabetics need to have a high index of suspicion for possible infection even if vital signs and lab results remain within normal ranges, or if no clear source of infection is apparent [1,6]. 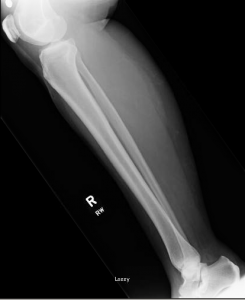 A 61-year-old Caucasian female presented to the emergency department due to increasing right calf pain, tenderness, swelling and inability to bear weight. Per the emergency department physician’s notes, the patient reported stepping out of an RV when she heard a pop and felt like her Achilles tendon was “overstretched”. She was not able to plantarflex on initial exam. No other injuries were reported. She denied fever, chills, nausea or vomiting. Vital signs were as follows: Blood pressure (BP) 158/75, Pulse 114, Temperature (Temp.) 36 °C (96.8 °F), Respiration rate (RR) 16 bpm, blood oxygen saturation (SpO2) 95%. Pertinent past medical history included obesity and hypertension. She reported prior hand ganglion cyst excision, temporomandibular joint surgery and tonsillectomy. Her family medical history was remarkable for maternal diabetes and maternal aortic valve disease. She was a former smoker (1 pack/day, quit 5 years prior) and consumed 1-2 alcoholic beverages a month. The review of systems upon arrival in the emergency department was negative. No abnormal integumentary findings were noted, specifically rash or erythema. Physical exam was positive for calf tenderness with palpation. A positive Thompson test was also documented. Vascular status was intact. Radiographs were ordered and revealed no bony abnormality or evidence of acute fracture (Figures 1a and b). The patient was diagnosed with an acute right Achilles tendon rupture and subsequently discharged. She was given a prescription of Vicodin and Ibuprofen and instructed to follow up with podiatry within a week. Figure 1a and b Lateral (a) and AP (b) radiographs obtained in emergency room at initial presentation revealed no bony abnormality or evidence of acute fracture. The patient followed up as instructed two days later at the foot and ankle clinic. She stated that she developed a blister to her right posterior heel and noticed redness to her right calf. She rated her pain as 10/10. She denied nausea, fever, vomiting, chills and diarrhea. Vital signs were as follows: BP 155/89, Pulse 89, Temp. 36.7 °C (98.1 °F), RR 16, SpO2 96%. On physical exam, she was neurovascularly intact. Significant global non-pitting edema was noted to the right ankle. A superficial bulla was noted to right posterior heel with serous drainage. Erythema was also present involving the posterior leg and foot. The musculoskeletal exam was positive for extreme guarding to right lower extremity. There was a negative Thompson’s test, in contrast to what the emergency department provider had documented. There was suspicion for infection; however, no obvious portal of entry was evident. The patient’s diagnosis was then modified to acute right Achilles tendon rupture with cellulitis. The cellulitis was thought to have stemmed from the bulla secondary to traumatic edema. The patient was placed in a CAM boot, instructed to perform daily dressing changes to the bulla and to return to clinic in two days for re-evaluation. A venous duplex was ordered and reported as negative for deep vein thrombosis. An MRI was also ordered at that time due to suspicion of infection. Figure 2 Sagittal sections from MRI revealed 114 mm large posterior compartment abscess. Intact Achilles tendon demonstrated (a-c). Axial bilateral T2 MRI showing the fluid collection in the right posterior compartment (d). The patient returned to the podiatry clinic two days later. She stated she had been compliant with non-weight bearing and dressing changes. She reported a perceived increase in posterior heel edema. Her vitals were as follows: BP 163/89, Pulse 94, Temp. 36.3 °C (97.4 °F), Resp. 15, SpO2 95%. Upon repeat clinical exam, the patient remained neurovascularly intact and extreme tenderness along the posterior lower leg was noted. Erythema and edema had worsened. Redness extended from her heel to the knee, both anterior and posteriorly. Expressible purulence was noted from the bulla which had increased in size and spread to her lateral heel. The posterior heel at the Achilles insertion site was enlarged and there was noticeable fluctuance, indicating an underlying abscess. A CBC was ordered and revealed a WBC count of 17,700 with a left shift. Although the patient had no previous diagnosis of DM, her fasting glucose was 268 mg/dL with an HbA1C of 10.5%. ESR was 105 and CRP was 23.7. Cultures were taken from the purulent bulla and revealed methicillin resistant staphylococcus aureus bacteria. The patient was admitted to the hospital and started on IV Vancomycin. 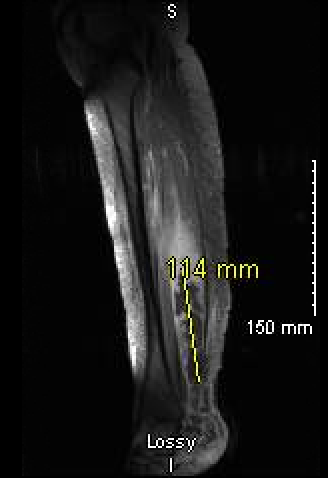 The previously ordered MRI revealed an 11.4 cm fluid collection present in the posterior compartment of the leg (Figure 2a-d). 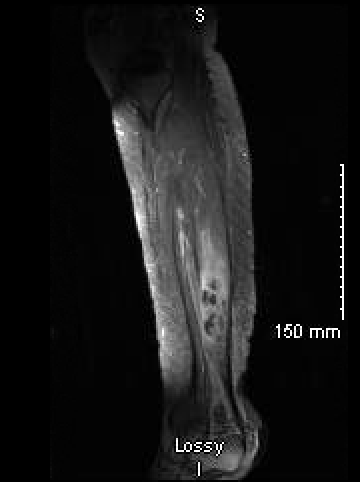 The Achilles tendon was fully intact with no signs of rupture (Figure 2c). The patient was consented for an incision and drainage of the purulent bulla in the operating room to be performed the following day. The incision and drainage was performed with the patient in the prone position. After an appropriate sterile prep was achieved, attention was directed to the bulla at the Achilles tendon insertion on the posterior aspect of the right heel where a stab incision was made (Figure 3). The stab incision was extended proximally until purulent drainage ceased at the level of the mid-calf. Approximately, 75 cc of purulent drainage was evacuated from the leg. Three liters of normal saline was used for irrigation of the leg. Upon completion of the procedure, major muscular and tendinous structures, namely the Achilles tendon, were noted to be viable. The infection was confined to the posterior compartment only. The macerated, non-viable skin where the original bulla had been located was excised leaving an approximately 4 cm x 1.4 cm void over the Achilles tendon insertion [Figure 4]. 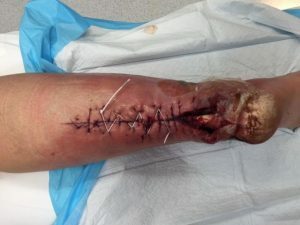 The wound was reapproximated using a combination of retention sutures and a vessel loop to reduce tension to the area (Figure 4). The wound was then packed and covered with a sterile dressing. Daily packing changes were performed with a repeat washout of the leg performed 72 hours later. Figure 3 Purulent drainage from the bulla on the posterior leg upon stab incision. Figure 4 Postoperative clinical appearance, demonstrating the extent of the incision required to ensure complete evacuation of the purulence. Vessel loop employed in a crisscross fashion in order to relieve tension. Note void with exposed Achilles tendon. At the second wash-out, all purulence was noted to be absent and all muscular and tendinous structures remained viable. Partial primary closure was performed at the proximal aspect of the incision. The distal portion could not be closed. A vessel loop in a crisscross fashion was again employed to assist with reapproximation. Vacuum assisted closure therapy of the wound (wound VAC) was then initiated over the exposed Achilles tendon and along the incision. The patient’s WBC normalized three days postoperatively. The patient was medically managed for her undiagnosed diabetes. Figure 5 Granulation tissue beginning to cover exposed Achilles tendon. Figure 6 Clinical appearance 26 months postoperatively: Complete granularization and re-epithelialization over posterior wound. Wound VAC changes were performed every other day while the patient was hospitalized. Upon discharge from the hospital, the patient received daily infusions of intravenous (IV) vancomycin for two weeks and all dressing changes were performed by enterostomal therapists. Although the infection had been eradicated, the challenge of keeping the exposed Achilles tendon viable for limb functionality remained. Over the next several weeks, the patient remained non-weightbearing and continued wound VAC therapy. At four weeks postoperatively, granulation tissue began to form over the tendon (Figure 5). 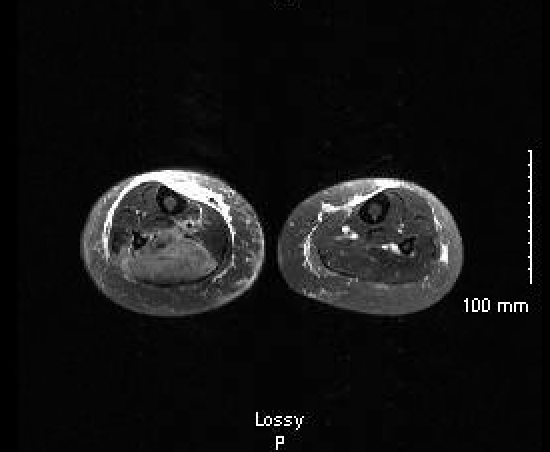 The tendon appeared viable throughout the entire process; however, there was noticeable contracture during this period of non-weight bearing. The patient continued this course with regular wound VAC and dressing changes at a wound care center. At approximately four months postoperatively, complete granulation over the Achilles tendon and skin re-epithelialization was noted. No additional surgical intervention was needed. Upon complete closure of the wound, the patient began physical therapy to regain ankle range of motion, strength and stability. After eight weeks of therapy, she was able to attain adequate ankle dorsiflexion. She remains completely healed with a functional limb 26 months post initial presentation (Figure 6). 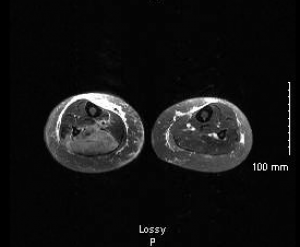 To our knowledge this is the first case report of deep posterior leg compartment infection in an undiagnosed diabetic patient initially misdiagnosed as an Achilles tendon rupture. On initial presentation to the emergency department and initial follow-up at the podiatry clinic, the patient’s large infection was masked due to the fact she was diabetic, albeit undiagnosed. She did not exhibit any constitutional symptoms of infection including fever, tachycardia, hypotension, or tachypnea. Additionally, there was no obvious portal of entry for the infection at the time of presentation. In this case, there were key steps that ultimately led to limb salvage. The first was made by the emergency department physician by stressing the importance of prompt follow-up at the foot and ankle clinic for immediate management. The second key step was the foot and ankle physician performing the repeat physical exam from presentation to the emergency department. The negative repeat Thompson test led the provider to consider a broader differential diagnosis (Achilles tendon rupture with cellulitis vs deep vein thrombosis vs infection). Additional tests were then ordered to help narrow the differential even though the patient wasn’t demonstrating any constitutional signs of infection. The two day follow up period as ordered by the foot and ankle specialist facilitated a prompt diagnosis and admission to the hospital immediately after review of the newly ordered labs and imaging. The timely diagnosis, admission, and incision and drainage ensured that the infection did not spread to other compartments or render the Achilles tendon nonviable. Following initial management, additional steps were also taken to ensure full future functionality of the limb. The repeat incision and drainage allowed appropriate assessment of the infected structures prior to definite closure to ensure limb viability. 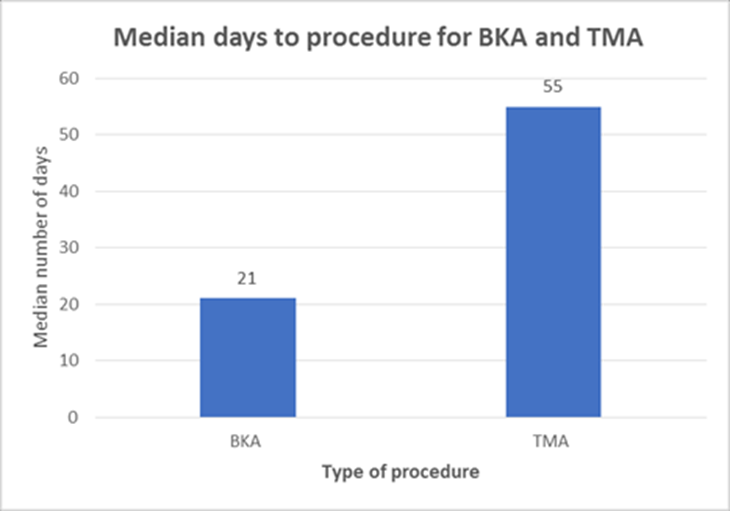 The decision to maintain daily infusions of IV antibiotics for two weeks postoperatively prevented recurrence and non-weight bearing status allowed for appropriate granulation tissue to form over the tissue void and exposed tendon. Alternative wound care products which may have resulted in faster would closure were unavailable due to the patient’s insurance. Despite this limitation, wound VAC therapy was successful at gaining full would closure. The final step which ensured limb viability and functionality was the referral to physical therapy in order to address the acquired equinus contracture. 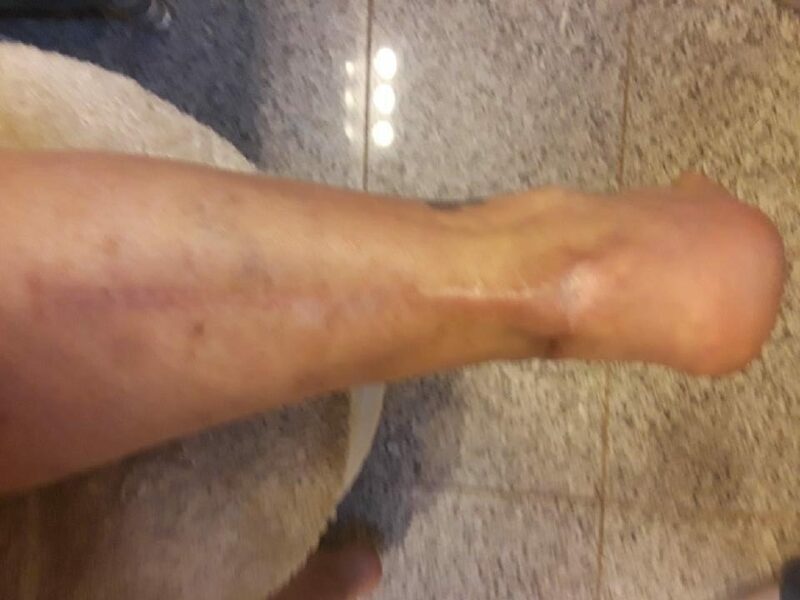 This referral was purposefully delayed until full would closure was achieved as early mobilization may have resulted in wound opening, and compromised healing, ultimately prolonging the course of treatment. 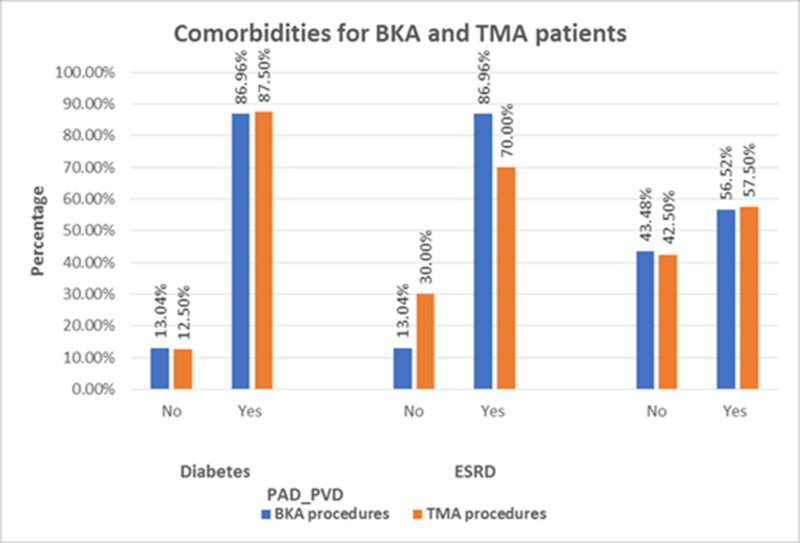 In conclusion, diabetic infections present unique challenges; however, when the proper precautions are taken limb salvage can be achieved. Geerlings SE and Hoepelman AI. Immune dysfunction in patients with diabetes mellitus (DM). FEMS Immunol Med Microbiol 1999 Dec;26(3-4):259-265. Tater D, Tepaut B, Bercovici JP, Youinou P. Polymorphonuclear cell derangements in type 1 diabetes. Horm Metab Res 1987;19:642-647. Moutschen MP, Scheen AJ and Lefebvre PJ. Impaired immune responses in diabetes mellitus: analysis of the factors and mechanisms involved in relevance to the increased susceptibility of diabetic patients to specific infections. Diabetes Metab 1992;18:187-201. Hostetter MK. Perspectives in diabetes. Handicaps to host defense. Effects of hyperglycemia on C3 and Candida albicans. Diabetes 1990;29:271-275. Andersen B, Goldsmith GH and Spagnuolo PJ. Neutrophil adhesive dysfunction in diabetes mellitus; the role of cellular and plasma factors. J Lab Clin Med 1988;111:275-285. Geerlings SE, Brouwer EC, Gaastra W, Verhoef J and Hoepelman AI. The effect of glucose and pH on uropathogenic and non-uropathogenic escherichia coli: studies using urine from diabetics and non-diabetics. J Med Microbiol 1999;48:535-539. Deresinski S. Infections in the diabetic patient: strategies for the clinician. Infect Dis Rep 1995;1:1-12.